So he was to fight a pro boxer age 29.. Tho with an awful record..
As feared.. The fight looks a total fix.. I cant help but respect hes in awesome shape, and if he just showed his love of the sport with some sparring vids, some of his regimen (like Ed O Niell / Al Bundy does with BJJ..) I would have loads of respect.. But paying some young punk to take a dive ?? Come on man..
Waharoa and Petter like this. Then again I wouldnt back him against 'amber lamps' bus dude..
Looks better than most guys at 62, and certainly better than most wealthy guys. Looks more like Iggy then he does Mickey. 555 anyone else notice the shorts? Guapo Siempre (Forever Handsome). He's a bigger douche bag than I thought. ....and he was a pretty damn good actor. 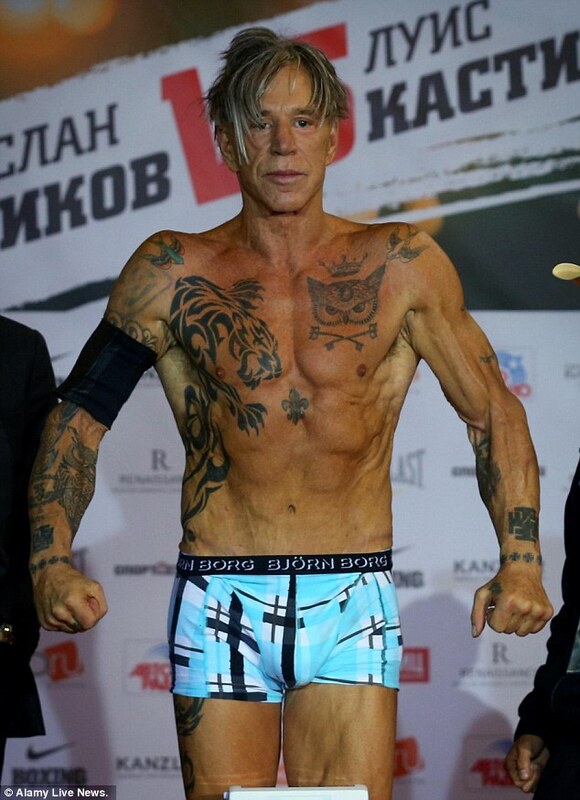 Rourke spent the early nineties as a professional boxer, winning six out of six matches, which later required facial reconstructive surgery to fix. 'Most of it was to mend the mess of my face because of the boxing, but I went to the wrong guy to put my face back together,' he told MailOnline back in 2009.